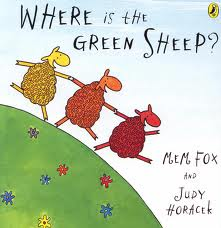 Where is the Green Sheep is a simple and educational book written by Mem Fox and Judy Horacek. This book was awarded ‘Book of the Year’ by the Children book Council because it provides some educational features such as musical instruments. This book is all about searching and predicting where the green sheep could be hiding. Where is the Green Sheep contains lots of different sheep with their own characteristics. Some of the characters that include: the Scared and the Brave Sheep, The Moon and Star Sheep and the Near and Far Sheep. Most of these characters are colourful and some are just plain white. This amazing book has some vivid descriptions and very important pictures which help young children to predict what is written below each page. This book also gives parents time to spend with their children and discuss the book. Short sentences, opposites and questions make this book even better. The short sentences are brilliant because they build suspense and make it easier for kid to read. The questions keep the kids thinking and wanting to read more. This book contains lots and lots of opposites which teach kids some antonyms which they will use in the future. The purpose of this book is to entertain kids with bright pictures. In the book there are bright, colourful pictures that include characters such as the green and red sheep. This book is recommended to young kids that like short books with bright, interesting and colourful pictures. This is a magnificent book that teaches kids opposites and an early start to reading. If your child doesn’t have this book, then they are missing out on some valuable education!